I had the gentlest shower I possibly could to make the hot water last for us both to wash our hair, and we succeeded! We decided to walk down to Knight Terrace, the road along the water’s front that had the shops, council offices etc on it. 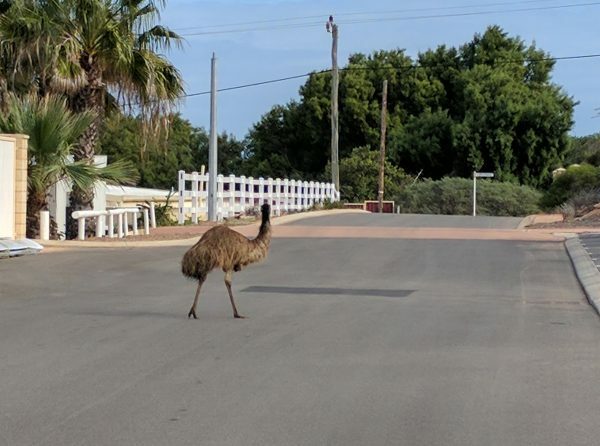 But when we got to the street behind that we had a surprise – there was an emu meandering down the street as if he was completely accustomed to doing so! I trotted ahead of David, who was dragging Marley in her trolley, to get some photos, and we got chatting to another couple doing the same thing. The foreshore and shop frontage was really nice. A long stretch, with sufficient variety to make it an interesting walk. 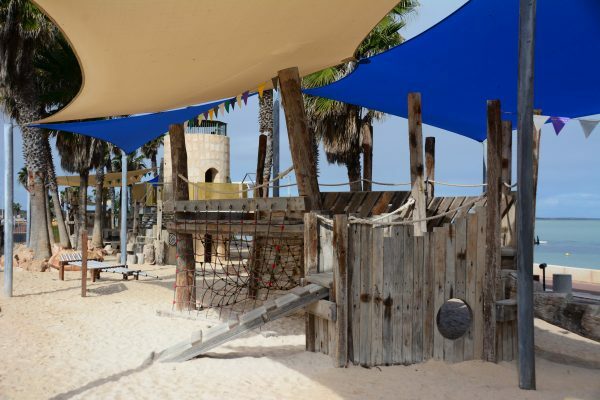 The foreshore had a band of grass and the most incredible children’s playground! There were harboured yachts making a very pretty sight on the water too. For everyone else, there was the attraction of Marley being chauffeured as well, and many people stopped to comment and to stroke her. We then made our way back up the little hill to Rosie and enjoyed a cheese, tomato and mushroom omelette for lunch. We had a tiny bit of drizzle fall, so decided to drive to the tourist information centre that we’d walked past in the morning. The lady in there was lovely and friendly and we grabbed some helpful brochures for the surrounding areas, as well as nearer home, and asked about Monkey Mia for another day. The sun came out and we walked around a bit more and took photos with our nice cameras that we hadn’t taken with us in the morning. Then back to Rosie for 3pm to have a drink and eat a home-grown grapefruit that we’d brought with us from home. At 4.15 David rang his dad from the car again and reported that mum was well and dad in good spirits. We played a couple of word games and then started to cook dinner at 5pm. We had our own freshly made grain-free garlic bread with garlic prawns by 6.30 and both were truly delicious! Then a bit of TV, did the washing up and headed to bed for 11pm. I found it a bit chilly when I woke and David turned on our little electric heater for me. 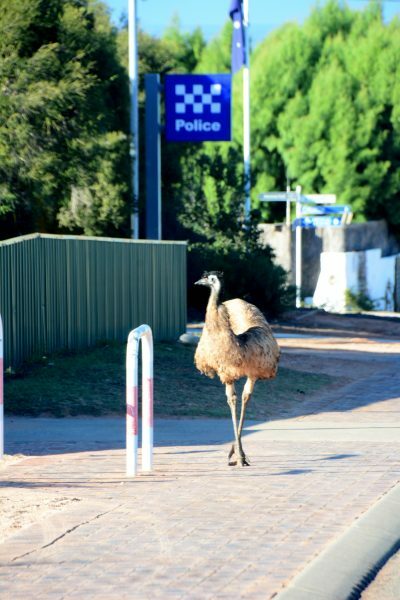 Once we headed out in Billie we stopped quickly at the little police station as there was the emu again! 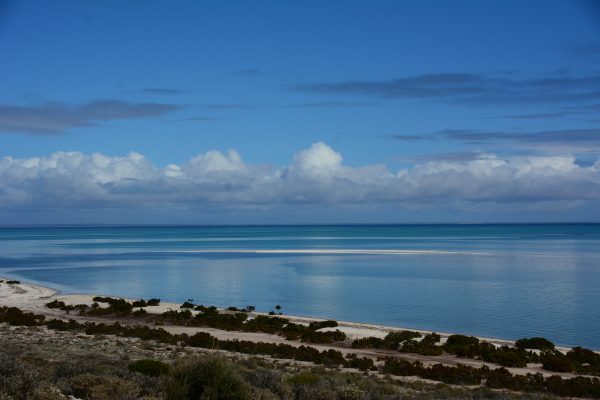 Today we wanted to explore all of the side tracks that headed off of Shark Bay Road and first was Eagle Bluff. This one proudly boasted of a boardwalk with views to the ocean below and, according to their display boards, you could often see sharks, dugongs and rays in the water. We didn’t, but it was a pleasant walk anyway. Next we decided to go to the beautiful bay – the furthest spot we wanted – and then work our way back. Oh wow, I loved this place so much. The sky was blue, the water was so blue, and the white of the clouds reflected in long clear panels towards us on the water. The sand was white and there was a clean, white sand bar out in the bay. It was just stunning. And the place doesn’t even appear to have a name. We enjoyed a snack of a banana, an apple and a lemonade fruit between us, and Marley got some water as well as a little bit of banana. She loves banana! As we left the bay, and were back on the main road, I caught a glimpse of the bay from another angle and asked David to stop. I walked back to take a few more photos, but I’d been higher in the car and didn’t really get what I was looking for so I jogged back towards David and the car. 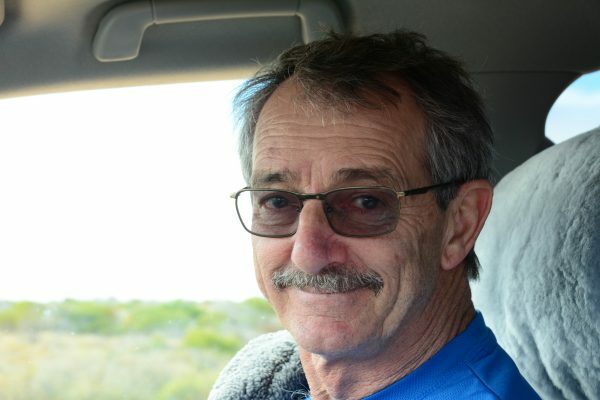 As I was almost there, David began to drive forwards. He said he was trying to go slowly enough that I wouldn’t notice he was moving! Cheeky wotsit!!! Once I caught up with him I took this photo of what a mean man looks like! We made a few stops down the various tracks on the way back towards Denham. Each track was corrugated, but Billie handled it all well and didn’t shake us around much at all. Eventually the next track led to Ocean Park. Here is an aquarium, but we couldn’t go to that with the dog. David went in to ask if we could take her into their restaurant so that we could buy some lunch and the answer was yes. In the meantime a man with an even smaller dog than ours came over to me to say that the spotlight bar on the front of our car was almost hanging off! Must have been from the corrugated roads. David managed to make some running repairs thankfully, and we were grateful to the man for noticing and telling us. We sat on an expansive deck at one of the tables under the shade sails, looking out over the same blue ocean as my beautiful bay. 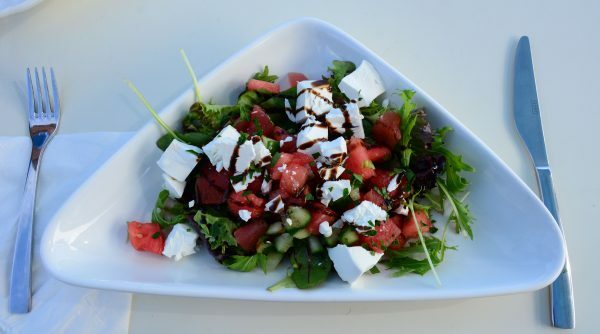 It was a lovely relaxing place to be and their watermelon and feta salad was really refreshing and tasty. A man at the next table mentioned Joondalup and Wanneroo to his fellow diners. It’s funny that you can go so far and end up sitting next to a virtual neighbour from home! Not ready to go home, we drove through to the other side of town and along a road for just a few kilometres to investigate Little Lagoon. This was such a quiet spot! 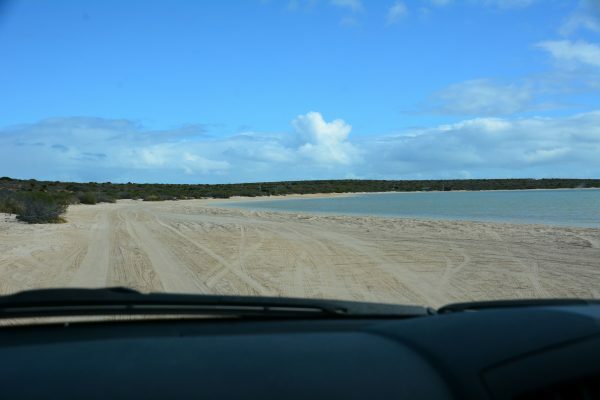 We drove along the sandy edge of the lagoon to the left where there were some deserted tables and shelters, with the only occasional sounds being the light breeze and some bird calls. We shared another one of our grapefruit and sat, ‘drinking in’ the peace and quiet. Time to go back to Rosie and I chose to have a nap for almost an hour while David more permanently fixed the spotlight on Billie. I was chilly by the time I woke up and asked David if he minded having the door shut. He did mind really, but was kind enough to do it anyway. We eventually walked into town for some cruskits and some dog food. Or at least, this was my understanding. David stayed outside with Marley and I went into the little supermarket. I couldn’t find the dog food we wanted anywhere so I rang David (who told me he’d seen them earlier) and he directed me to a hidden fridge where it was secretly housed and I grabbed one. Once I’d paid and gone outside he said that we’d decided not to buy any. I was a bit mystified as to why he’d helped direct me to the correct fridge in that case, but he said he thought I only wanted to look. This is probably the reason we’re still together after 42 years – we can both accept the other’s point of view on situations such as this and not argue about them. While I was in there, the lady from the tourist bureau walked by and stopped to speak to David, having recognised Marley in her baby sling. Back at Rosie, David made his daily call to his dad and reported that all was well, for which we were both very grateful. We prepared our chicken minestrone soup with cheese puffs, ate, watched some TV, washed up and were in bed for 10.30. It’s incredible how our body clocks move forward so naturally when we’re on holidays compared to the usual 2am bedtime.